– Yeah, I remember how we had to gobble up our food, pee and play tag in 15 minutes. So who do we blame again for our problems with indigestion? – If it’s a public school, parents will complain about their tax contribution going to waste. If it’s a private school, the school board will be accused of swindling money. Ah… tightwads. Don’t have kids, then. Kids are supposed to have fun. – Homework? Dude, your kids spend half a day/full day in school and you want them to come home with more workload. And then you complain about yourself having to work overtime or take your paperwork home. C’mon la! Give the kids a break. They are human beings like you. Well, maybe not you, since you’re turning them psychotic. They are going to end up in an asylum and you will have to spend their education fund on their psychiatric treatment. Wow… the irony of striving for academic intelligence only to get mental retardation in the end. 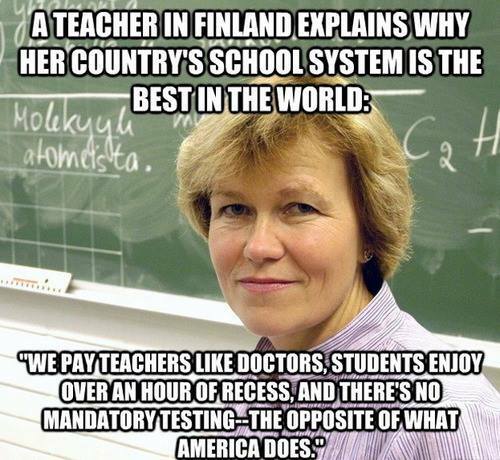 I don’t know what other nonsensical things parents will complain (and kick around like a freaking 2-year-old tantrum artist) about if our education system ever go the Finnish way. I still stand my ground that the education system in any Asian school is very much influenced, if not controlled, by the expectations of parents who are more kiasu than kiasiaw. ← Done writing, now what? I disagree with homework. My poor little guy. I actually miss my kid when he’s gone. Like you said, I don’t bring work home. I’d be pissed if I had to bring work home. I hated homework in school also. I know, right? I just sat through a huge stack of homework with my five-year-old just because she missed two days of school. The poor girl was in tears by the time she got to her eighth book and she had three more to go.